When the iPhone 8 and X were revealed, a photography feature known as Slow-Sync flash was mentioned, but with little explanation. Slow-sync flash is nothing new, in fact it's been around for years in digital cameras. We'll explain how this works and give you some example shots, while also comparing some iPhone 8 slow-sync flash photos versus iPhone 7 traditional flash photos. To understand slow-sync flash, we first need to understand how a camera works. Every camera has a shutter in-between the lens and the sensor. It stays closed like a blindfold or an eyelid, and opens up to let in light for a photo. By default, most photos are automatically taken with a fast shutter speed, meaning the shutter opens for only a split-second before closing. The reason for this is so it captures light from that split-second, which freezes motions and leads to a very sharp photo. When you have a low shutter speed, meaning the shutter stays open for a longer period of time, motion will no longer get frozen since it's capturing light for so long. The issue with this is that the photo can get blurry, either from motion in the subject, or shake from the users' hands. Although, you can get some pretty cool photo effects if you know what you're doing, like writing in the air with sparklers. You can also manually set the shutter to stay open indefinitely, even for hours, meaning it will constantly take in every bit of light and combine it together into one photo, leading to amazing images like a starry night, and for even longer shutter, star-trail photography. Now let's add flash into the mix. There are two main flash sync methods: rear curtain and front curtain. Let's say, for example, the shutter stays open for half a second. Front curtain would initiate the flash as soon as the shutter is open, and then keep the shutter open for half a second. Rear curtain would keep the shutter open for half a second, and flash just before the shutter closes. Here is an example of both, front curtain at the top and rear below. Obviously, rear curtain makes a lot more sense, giving the effect of running at high speed. Now let's introduce exposure into the mix. Exposure determines how light or dark an image will appear when it's being captured by your camera. If you aren't using flash at night, let's say to take a landscape photo, the camera can properly expose for the background. But if you also have a subject in the foreground, they'll be underexposed, or way too dark. To see the subject, you must turn on flash. The camera then adjusts the exposure much darker so that when the flash goes off, the subject is properly exposed and isn't blown out, meaning way too bright. The issue with this traditional flash technique is that since the whole image became darker to adjust for the subject, so now you can't see any details in the background. 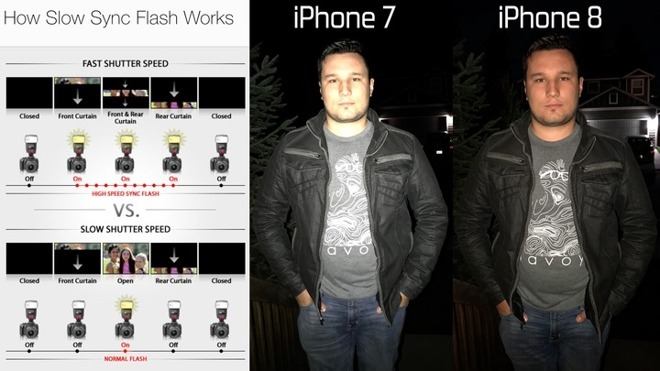 Now let's take a look at how a slow-sync flash photo will work on the iPhone 8, X, and future iPhones. The camera knows it will flash, so it first darkens the exposure. The shutter opens, but stays open instead of quickly closing. Just before the shutter closes, the flash goes off and freezes the image. Since the shutter was open for a longer period of time, it combined and took in more light from the background, making it brighter. But it also took in more light from the subject itself. Because of this, the flash didn't have to be as bright, so the subject is no longer overwhelmed with light. Now combining the brighter background with a less bright subject, the photo looks much better lit overall. The only issue is that since the shutter was open longer, it captures more motion, either from camera shake or movement within the image, leading to motion blur. Luckily, most motion blur from the subject is easily dealt with by the flash, since the final split-second of the flash-lit image will cover up any motion blur directly underneath it. The background may look a little blurry, but that's usually not where the attention is, and it also leads to some very cool looking photos. If you do, on the other hand, want to have a sharp photo with no blur, you'll have to first choose a background without any motion, then tell your subject to stay completely still, and finally, do your best to keep your hands still as well. To sum it all up, with the new iPhone 8 or X, you'll be able to take better photos than ever with flash.